You guys remember when I used to give Math Lessons here, right? There was one particular lesson focused on the Dogfish Head "Minute" IPA series, so I find it particularly awesome that Dogfish Head's 20th Anniversary beer is named Higher Math! Check out their post about it and be sure to watch the quick video with Sam. As the label says and Sam said in the video, this is their 20th birthday cake in liquid form, a luscious chocolate-cherry birthday cake weighing in at 17% alcohol. Yep! The label is dynamite! Forest green background with gold foil highlights and lettering in the form of the actual birthday cake. And the Dogfish Head logo is turned vertical to be the candle in the Giant 20 on top! Bottled on 10/20/15. Oh, and almost $10 for a 12 ounce bottle, but I feel a must for a fan of the brewery. OK. Dogfish is one of my favorite breweries, but my only Dogfish glass was long-ago broken. 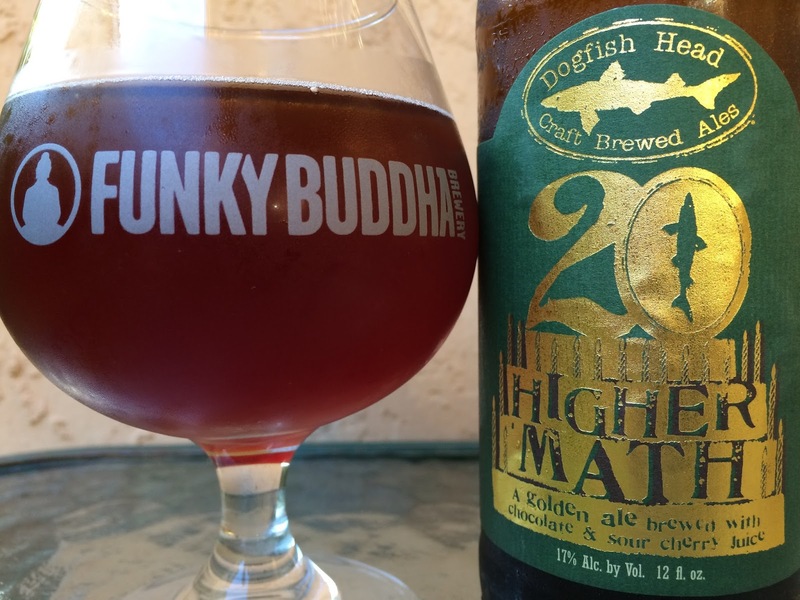 So I decided to pour this treat into a snifter from another favorite brewery, Funky Buddha. Lots of cherries in the aroma, both sweet and tart. If you take your time, and you will, eventually the chocolate component starts standing up to that cherry in a great contrast. Mega-rich sweet toffee and butterscotch flavors start. Tart cherries add an immediate contrast, followed by hints of vanilla, sweet raisins, and that rummy cake they make at the holidays. 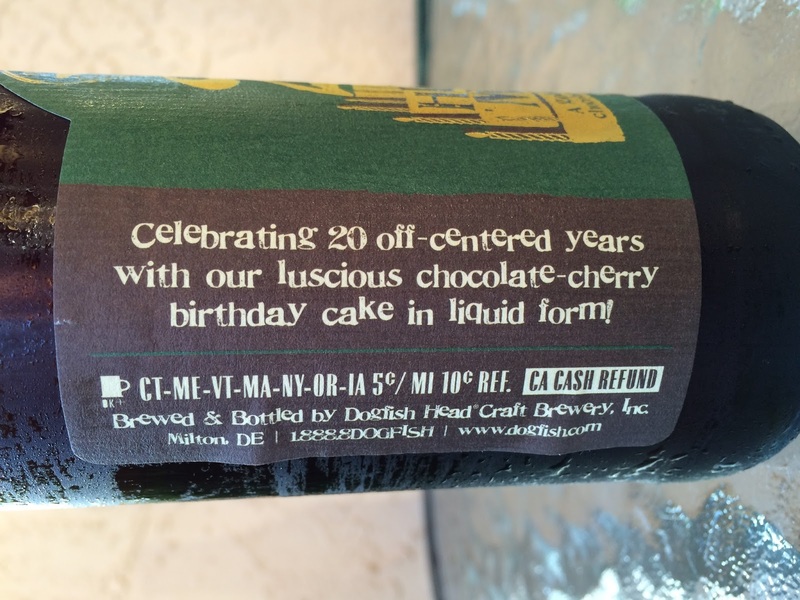 There is a definite chocolate flavor, too, and that builds more as you let the beer warm up. I taste some leather and smoke nuances linked directly with that chocolate. Now, you will NOT miss the boozy sherry type alcoholic aspects in every sip, along with some light heat in the throat. But for a 17% alcohol beer, this is major danger, so well incorporated. Super interesting, crazy nuances and complexities. A sipper to check out for sure. Sweet yet the alcohol helps balance from being over-the-top. Huge body, syrupy, sticky, full of flavor. Finally... You know what happens when you drink an entire bottle of 17% beer? You basically give up on math, especially higher mathematics like algebra and geometry (which ironically my 13 year old son JUST asked for help on, LOL. I told him to text his genius classmate! Parenting rules!) Higher Math is no academic tutor!